The following is a guest post from S.E. Adkins, a North Side neighbor & consultant who draws on her diverse experiences and accumulated knowledge to help small businesses, non-profits, and individuals. Please join us and City of Asylum/Pittsburgh Wednesday evening for a screening of Burma VJ. The film Burma VJ, by Anders Østergaard compiles smuggled footage from individuals using handicams on the streets of Myanmar to tell the larger story of the so-called Saffron Revolution. In Burma, called Myanmar by the ruling military junta, a disproportionate amount of national income is spent on the armed forces. Living in one of the 20 poorest countries in the world, ordinary Burmese citizens live on little income while the costs of basic commodities such as rice and eggs continue to rise. In February of 2007, small groups began peacefully protesting the state of consumer prices. The protesters, including the monks, were dealt with brutally. Arrests and killings became a hallmark of the military junta’s response to such protests. The video journalist (the VJ in Burma VJ) became revolutionary in their witness of these events. The videos would reach back into Burma by satellite, and were available for international media use. As foreign media is banned, this is even more crucial. Burma continues to be a topic of wide global importance, underscored by the more recent news stories regarding the imprisonment of Aung San Suu Kyi and the government’s negligence of its people following Cyclone Nargis. The people have very little civil and personal freedoms. City of Asylum/Pittsburgh knows first-hand about this, with their mission being to provide sanctuary to writers exiled under threat of death, imprisonment, or persecution in their native countries. The current writer-in-residence is Khet Mar, herself from Burma. She is a journalist, novelist, short story writer, poet, and essayist. She and her husband, Than Htay, a visual artist, are working together to create a mural representative of their story and the intersections between Burma and Pittsburgh. There will be a film screening of Burma VJ at the Mattress Factory on Wednesday September 23rd at 7:00 PM, followed by a reception and Q&A with a monk from the Saffron Revolution. 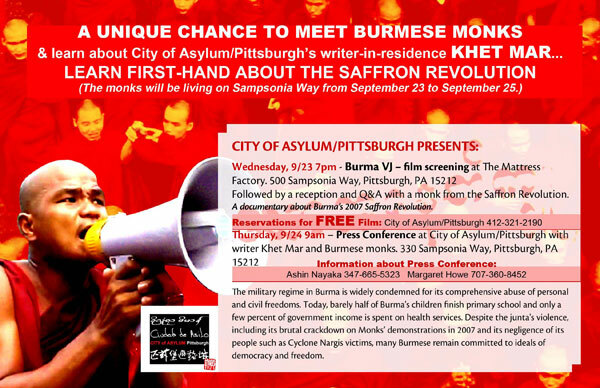 The next day, Thursday September 24th, at 9:00 AM a press conference will be held at City of Asylum/Pittsburgh with writer-in-residence Khet Mar and Burmese monks. This is a unique chance to meet Burmese monks from the frontline of a revolution, and to learn more about City of Asylum/Pittsburg’s newest writer-in-residence, Khet Mar. I hope to see you at one of these special events! Reservations are FREE, but must be made in advance by calling 412-321-2190. 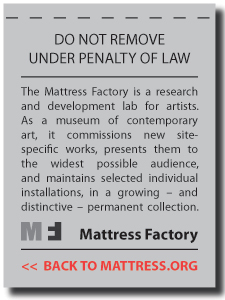 Approximately one year ago, the Mattress Factory began experimenting with QR (or Quick Response) codes and this past April the museum became the first in the United States to utilize the technology on-site as a visitor engagement tool. More on that HERE. Our use of QR Codes in the galleries has been getting some attention (1,2), and I've fielded numerous inquiries from artists and arts organizations wishing to utilize this technology in their practice or operations. One can only presume that, as 2D barcode technology continues to evolve and becomes more accessible to more people, more artists and arts orgs will want to utilize it. And on the heels of that interest comes people and companies that will attempt to capitalize from providing clients with an essentially open (read: FREE) technology. So, in an attempt to save our fellow artists a boat-load of money, we decided to publish a step-by-step guide for those who wish to experiment with QR code technology. No consulting firm needed. Please keep in mind that this is only how we here at the MF implemented the codes. If you think there are better ways, or workarounds, please share in the comments to the post. Give people or visitors a reason to open the codes. The codes we place throughout the galleries contain link to mobile browser optimized (JI - 9/15/09) rich multi-media content that provides context or backstory to the artworks we exhibit. We upload video files to YouTube, behind-the-scenes still images to Flickr, and informative text-based PDF files, all of which are supported by QR code technology accessible via most mobile platforms (JI - 9/15/09). Universal codes that access a stagnant website may prove to be less interesting to your audience. Once you have developed the content you wish to share with your audience, it's time to make the codes. We use a very simple web generator provided by Kaywa. This generator is nice because it provides output & resolution options. If you're creating a print piece, you can select the extra large file output which optimizes quite nicely for signage. Because the density of information contained within a code can effect its readability, we shorten all URLs with http://bit.ly. This may seem like a frivolous extra step, but it greatly impacts the ease with which our codes are read. Below are two codes that open the same URL. The URL embedded in the less dense code on the right has been shortened making this code easier and more consistently read. Once we generate our codes, we design the signage and collateral materials that will hold them. Codes can be displayed and read in hardcopy or electronic (screen) format. The only obstacle we've experienced has been customizing the size of the codes. Ideally, we'd like the codes to be smaller (i.e. 3/4" x 3/4"), but the smallest we've been able to go with consistent readability has been 1.5" x 1.5". As QR technology and hardware progresses, I anticipate the ability to reduce code sizes will emerge in the near future. Mattress Factory gallery card containing a QR code. Let's face it. The unknown scares people. And new technology has a way of intimidating potential users. We knew going into this that it was imperative to present the codes to visitors through technology they were already familiar with. 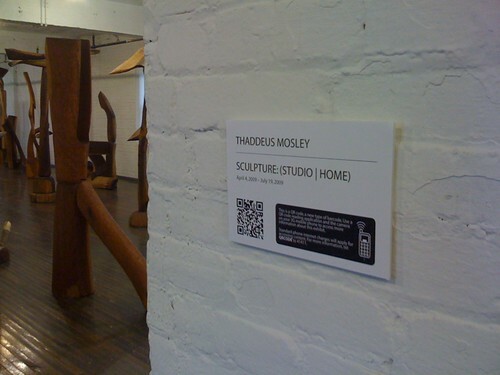 We started by hanging several "This is a QR Code" signs in the museum lobby and elevator. These signs contain a short description about what the codes are. We knew visitors would have more questions about the codes that would be impossible to answer through signage, so we created a simple text message (SMS) info relay. Through TextMarks, an inexpensive and easy SMS shortcode provider, visitors who send the keyword QRCODE to TextMarks' shortcode receive an immediate reply containing two links. The first link directs the user's mobile phone browser to a site that detects what type of phone they're using, provides more information, and a FREE download of the appropriate code reading application. The 2nd link directs iPhone users to App Store, where they can download the most current FREE version of the BeeTagg Multicode Reader. There are numerous barcode reading applications available on most mobile platforms, but we recommend BeeTagg because of it's universality across the spectrum. In fact, factory-installed readers are now common on many phones including Nokia devices and the G1 Android. This SMS information relay has proved to be a vital piece to our QR code puzzle and has served those visitors curious about the technology greatly. So this is what worked for us. I'm interested to hear if other organizations find this information useful and beneficial. For further reading about QR codes in a museum setting, check out how the Powerhouse Museum in Australia has been using them. If you have further questions or a tip that might help others to implement innovative use of QR codes, feel free to leave a comment. If you'd like to hit me up off-line, shoot over an email or track me down on Twitter.